I’ve now made two or three different renditions of this recipe and it’s become one of my favorites. It’s a great way to use up any leftover vegetables in your fridge and is healthier than most of the things I can come up with to eat for a quick meal. 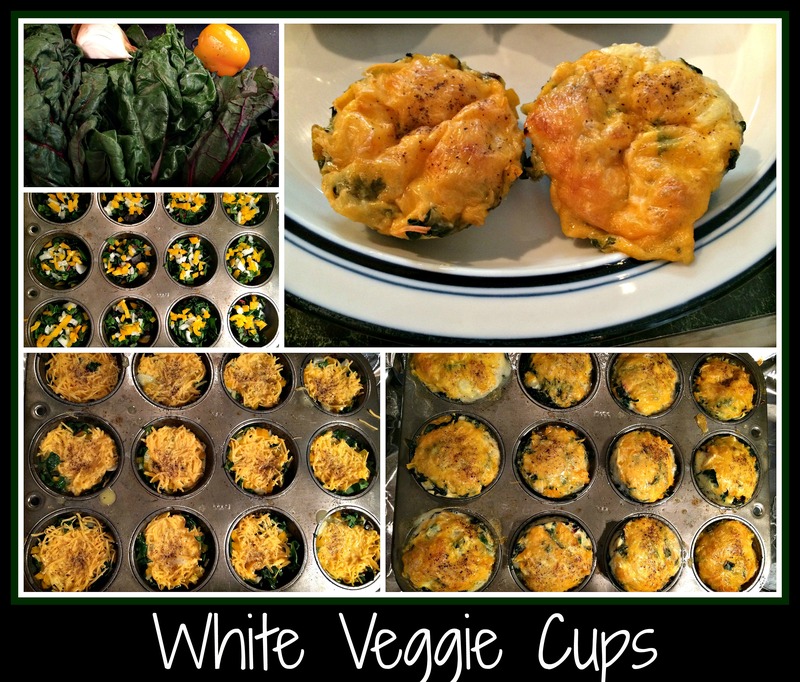 Veggie cups (made with some white wine) are delicious, versatile, and even freeze-able! Chop all your veggies, put your egg mixture together, spray your muffin tin with cooking spray, and pre-heat your oven to 375 degrees. Into each muffin cup, place some chopped greens, chopped onion, chopped veggie (yellow pepper, tomato, whatever you’re using), and top each with a sprinkling of cheese. Add seasonings. Ladle a bit of the egg mixture into each muffin cup, using the ladle to push the veggies and cheese into the egg mixture. If you have extra egg mixture left over, add it to the cups so everything is as equal as possible but DO NOT overfill the cups. They should be about 3/4 full since they will puff up as they cook. Cook the Veggie Cups at 375 degrees for 18-20 minutes until the egg is set. Allow the veggie cups to cook slightly before removing them from the pan and serving. This recipe is extremely versatile. You can add bacon, sausage, or ham to the veggie cups if you’d like. You can substitute vegetables as you prefer. This is a great way to make a quick breakfast sandwich but simply toasting an english muffin and putting one veggie cup in the middle. Play with this recipe and see if it doesn’t become one of your favorites as well. This entry was posted in breakfast recipe, cooking with wine, easy recipe and tagged cheese, cooking with wine, easy recipe, eggs, single servings, vegetables, vegetarian, white wine, wine.